About 40 Winnipeg executives and business leaders braved the frosty temperatures overnight to sleep outside. 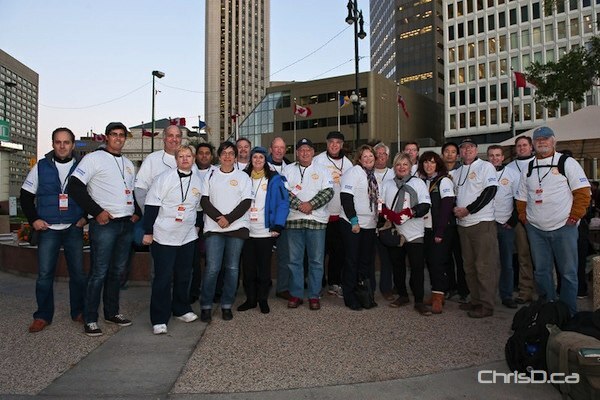 Late Thursday, the CEO Sleepout commenced in the courtyard of 201 Portage Avenue to help raise funds and awareness for homelessness and poverty issues in the city. “The discomfort of sleeping on the streets is just a fragment of a larger reality that we hope to highlight with influential leaders of the corporate community,” said Stefano Grande, executive director of the Downtown Winnipeg BIZ. Funds raised will go towards the BIZ’s Change for the Better program. The goal was to raise $100,000. UPDATE: $107,000 was raised from the event.